The peace process between Turkey and the Kurdistan Workers’ Party (PKK) is threatened by ceasefire violations and spillover from the conflicts in Syria and Iraq. Both sides must set aside pretexts and inertia and seize the opportunity of having powerful leaders able to implement a deal whose outlines are clearer than ever. After three decades of conflict that took the lives of 30,000 people, displaced millions and brutalised a generation or more, both the Turkish government and the PKK realise that a military victory is impossible. In its latest report, Turkey and the PKK: Saving the Peace Process, the International Crisis Group sets out in detail the parameters of a possible peace deal. Whatever the final outcome, basic issues such as transitional justice, disarmament and decentralisation need to be more broadly and deeply discussed so that public opinion on both sides begins to accept compromises that will be necessary to end the violence. On a public, political track, the two sides need to articulate realistic end goals, end abusive rhetoric and implement reforms to ensure Kurds enjoy full rights as Turkey’s citizens. On a second track of secret talks in progress since late 2012, the two sides must negotiate a deal that includes disarmament, which for now can only be inside Turkey; conditions for an amnesty that is broadly palatable and legally unchallenged; an independent truth commission reporting to parliament; and a transitional justice mechanism to deal with abuses by both sides. The government must further build up the legal and political framework for a peace deal, allow a united PKK negotiating team under jailed PKK leader Abdullah Öcalan, agree compensation for the state’s past wrongdoings, and continue to legitimise scenarios – once all violence ends – in which PKK figures can join legal Kurdish parties in Turkey and even Öcalan can hope for freedom. 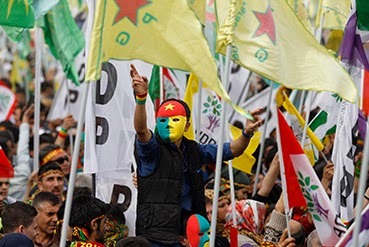 The PKK needs to convince Turkish, Kurdish and international opinion that it can be a democratic political actor, ready to fully disarm at least inside Turkey’s borders. It must accept responsibility for its own abuses, denounce all violence, and clarify whether it seeks decentralisation, federal autonomy or independence. It may be the single biggest actor among Turkey’s Kurds, but it also needs to accept that it does not represent the majority of Kurds. “Despite a recent rise in hostilities, particularly in south-east Turkey, the process has proved to be useful for the entire country and should not be jeopardised to score short-term political points with hardline Turkish and Kurdish constituencies”, says Didem Akyel Collinsworth, Turkey Senior Analyst. “But to achieve sustainable peace, it needs a more comprehensive agenda, a more urgent timeframe, better social engagement, mutually agreed ground rules, and clear and objective monitoring criteria”. “The two sides should not let old reflexes and daily news distract them from focusing on resolving their main conflict inside Turkey”, says Hugh Pope, Europe and Central Asia Deputy Program Director. “Without first achieving peace at home, both will remain highly vulnerable to what is in fact their common enemy, the Islamic State in Iraq and Syria”.